Get ready for STAT SHEETS. 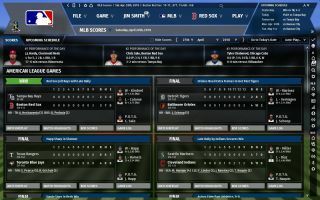 The top Major League Baseball management sim series returns to PC on March 22 with a redesigned interface, 2018 opening rosters and "dramatic 3D enhancements". The 3D mode has been updated with animated players and "improved ballpark models". The new interface comes with a selection of skins and even a choice of fonts. Fingers crossed for the inclusion of the most noble and imposing of fonts: copperplate gothic. Systems-wise, Out of the Park Developments promises greatly improved AI, a reworked chemistry system, revamped scouting reports and home screen customisation that gives you "total control over your virtual front office." Find out more on the official site. You can also check out the trailer below, though it's mostly just big words in a font that isn't copperplate gothic. It's a great series, though. We loved Out of the Park 17 and gave it a near-classic score of 89 in our review.